When choosing the time capsule shape you need, consider these things first. You might have a preconceived notion of what shape the capsule should be. "Shouldn't it look like a pill capsule?" is a comment we often hear. 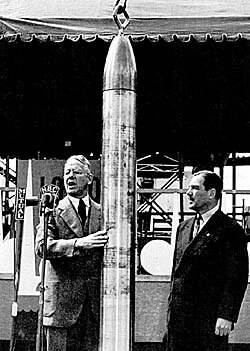 The bullet shaped Time Capsule of Cupaloy at the World's Fair in 1939 gave people the vision and then the preconceived notion of what shape the capsule should be. But when you actually do your time capsule, it's a different matter. You need to ask some important questions when it comes to deciding the shape of time capsule that you need. First, if you have the time capsule items already, do they fit in one shape better than another? Maybe you have a lot of posters or banners or items that can be rolled. That would make a cylinder shape ideal. But if you have boxes of photos, books, and large bulky artifacts (such as a 12x12 photo album) then perhaps the rectangular prism shape is a better decision. How Much Can I Fit in it? 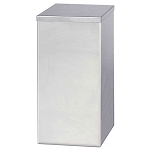 Capacity of a cylinder is less than the same general size of a box shape. You can always fit more items into a 12x12x24" box than you can into a 12" d x 24" long cylinder. So how does a cylinder’s area compare to a box’s area? You figure a cylinder’s area using the formula pr2h, where p (pi) is 3.14159, r is the radius (half the diameter) and h is the height of the cylinder. For a cylinder that’s 12? in diameter and 24? tall, for instance, take 6? x 6? x 3.14159 x 24?. This yields 2714 cubic inches. You figure the area of a box by taking LWH, where L is the length of one side, W is the measurement or width of another side, and H is the height of the box. For a box that measures 12? x 12? x 24? that gives you 12x12x24 or 3456 cubic inches. So, you get a larger capacity inside of a box time capsule than you do a cylinder. What kinds of contents lend themselves to a cylinder shape compared to a box shape? If you must roll something and not store it flat, a cylinder shape is the way to go. Figure on a height that your poster or set of building plans or banner measures after it’s been rolled up. Measure the diameter of your roll to make sure it fits within the diameter of the time capsule. If you have a large quantity of documents and papers and books, those items fit best into a box time capsule. Photos should be stored flat, so the larger photos are best stored in a box time capsule or in a time capsule cylinder whose diameter is large enough to accommodate the width of the photo. Some people prefer the look of the tube or cylinder shape. This is a personal preference. The box shape is most practical for most archives items such as books, papers, and memorabilia – and those kinds of items are commonly placed in time capsules. 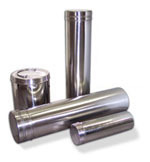 For the time capsules that we offer, we have both cylinders and box shaped time capsules. All are stainless steel. Our family & school Future Line cylinders come in four set sizes that we had made in quantity. 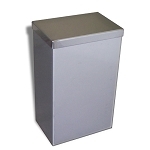 Our box time capsules are made one at a time and we can accommodate varying dimension. 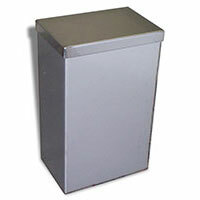 Our box shaped time capsules include the Simple Capped and also our Bolted Time Capsule models. Cylinder vs Box Time Capsules – Shape – what are the choices? The shape of a cylinder is like a tube. 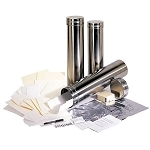 Our family and school Future Line time capsules are cylinder shaped and can be buried for up to 65 years or more. The shape of a box is a rectangular prism. 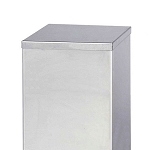 We offer 2 kinds of time capsule boxes, simple capped for up to 75 years or more, and bolted time capsules for up to 100 or more years.